A charming part of Bergamo that was once an important meeting place lies just outside the Città Alta (upper town). Piazzetta del Delfino (the little square of the dolphin) used to be at the heart of the city with four busy roads leading into it, before the Venetians built the walls round the Città Alta in the 16th century. You will come to the Piazzetta if you leave the Città Alta through Porta Sant’Agostino and walk down Via Pignolo towards the modern part of the Città Bassa (lower town). Off the Piazzetta Delfino to the left is Via San Tomaso, which leads to Piazza Giacomo Carrara where the Pinacoteca dell’Accademia Carrara and the Galleria d’Arte Moderna e Contemporanea (GAMEC) are located. Off to the right, leading to Viale Vittorio Emanuele II, is Via Pelabrocco, which has two buildings that were used as shops in the 13th century. The other turning off to the right is Via Masone, which leads to Via Antonio Locatelli, on the corner of which is Bergamo’s distinctive 1930s Poste e Telegrafi building. Spare some time to sit outside the bar in the Piazzetta and take in your surroundings. 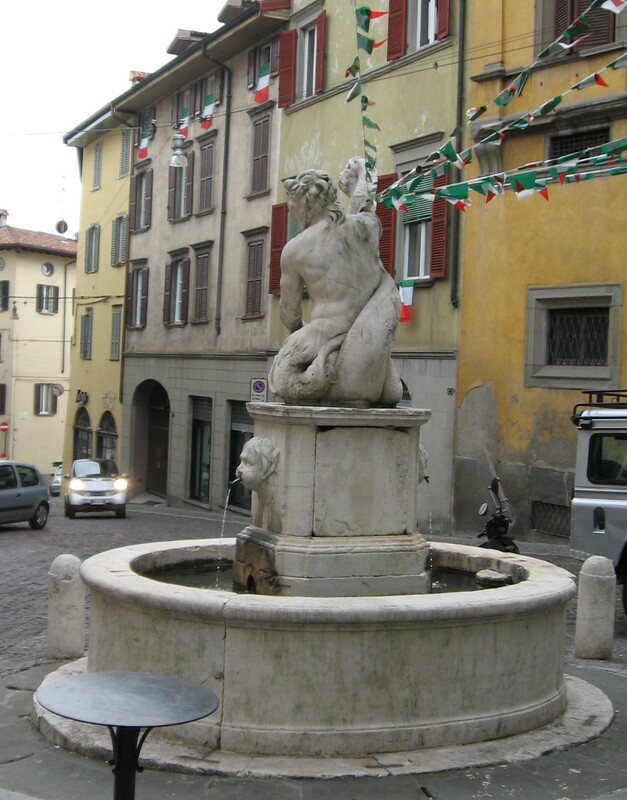 In the centre of the square you will see la Fontana del Delfino, which was designed in the 16th century. This was the period when the city’s fountains, which were so vital to the well being of the residents in each area, began to be less functional and were created in such beautiful shapes that they were eventually recognised as works of art. The pine cone on the fountain is the symbol of Via Pignolo, which was once just a pathway through woodlands, but went on to become the main route to the Città Alta for travellers arriving from Venice. 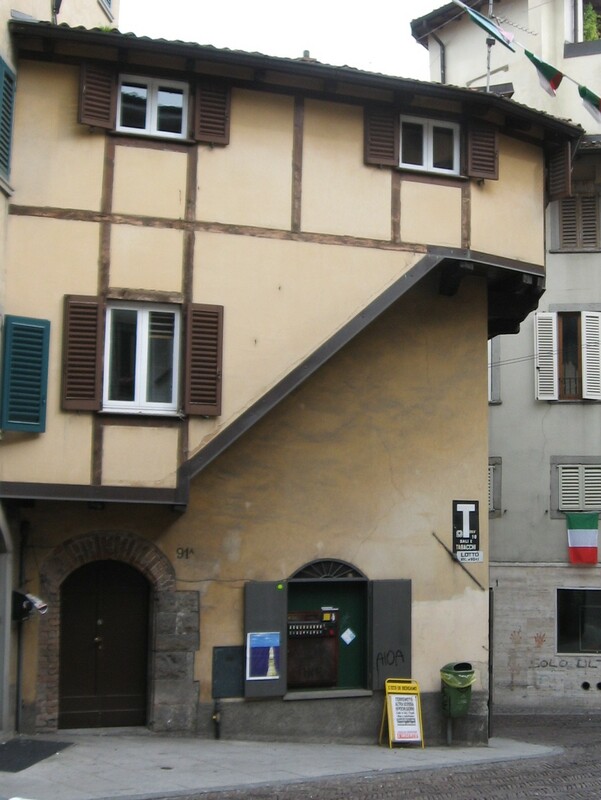 Don’t miss the little house with the jutting-out upper storey (pictured above), reminiscent of medieval architecture in Germany, which is the only one of its kind in Bergamo.